I have this secret dream about voyaging the ocean on a tiny boat, frankly not sure I would have the balls to actually do it. But it can and is getting done. So, I always enjoy reading about small boat travels. 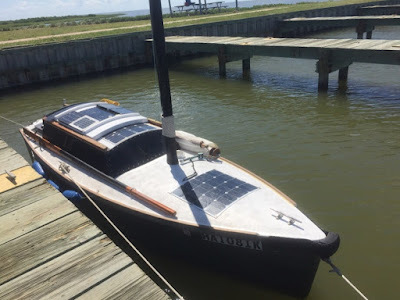 One blog I follow and really enjoy is called Graduating to a smaller boat, the author Dave last year has sailed around the Hawaii islands, sounds easy, but it is not. This past Saturday, he posted about his crossing of the Gulf stream from Key Largo to Bimini on his Paradox 14 (4.2m designed by Matt Layden) that he himself built. I love the Paradox 14 for a single handler (I even have the plans), but if I ever see one close by, I'm buying it! Anyways, believe it or not, he is not the first one on such a small boat. Many have done the crossing to the Bahamas, most notably Dave Bolduc on his 3.6 meter ENIGMA (also designed by Matt Layden).